Update: Thursday, 12 p.m. — Vice President of Student Affairs and Services Denise Maybank responded to requests for comment Thursday morning after multiple attempts to reach her had failed. In an email, Maybank said cases sent to her "are reviewed for three specific purposes: procedural error, arbitrary or capricious actions and appropriateness of sanction." During a review, Maybank said all documentation in a case is carefully considered. "In order to maintain the integrity of our process and to ensure the rights and safety of all students, this is a necessary part of the process although it may not always yield the desired outcome for those involved," she said. During winter 2013, Elizabeth was a visiting faculty member at MSU, when her ex-boyfriend — a graduate student and teaching assistant at MSU — broke into her apartment and attacked her significant other. This incident followed stalking and threats made to Elizabeth and her loved ones. Elizabeth, who asked that her last name not be published, called 911 while she said she hid in the bathroom. He was charged with felony breaking and entering, which would be reduced to a misdemeanor following a plea bargain. 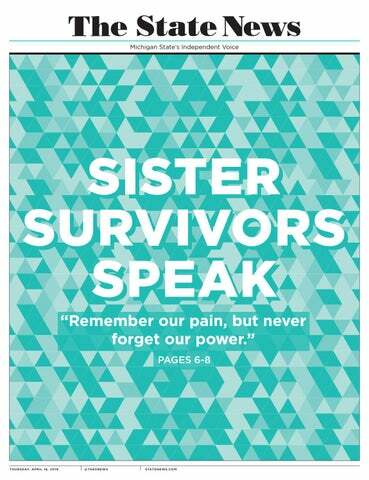 She remained quiet until the same perpetrator assaulted another woman at MSU — this time, an undergraduate student. At this point they both reported their cases to MSU’s Title IX office in October 2014. In December 2015, Vice President for Student Affairs and Services Denise Maybank chose to overturn a decision to expel that graduate student and instead suspend him for two years, even though he had been found responsible for both cases of policy violation — a harassment violation against Elizabeth in 2013 and harassment violation against the undergraduate student in 2014. "What would you actually have to do to get expelled is what I’d like to know, because it seems like kicking someone’s door down and physically attacking them along with making death threats and stalking them — and doing it twice — should probably be enough"
Maybank did not respond to various emails and phone calls regarding this story. The State News was told by her assistant a comment would be made via email on Jan. 27. As of 5 p.m. on Jan. 27, The State News did not receive comment from Maybank. The accused party was already serving a university imposed probation for his 2014 case at the time of Maybank’s decision and had been through the hearing board and the appeals committee — both of which found the sanction of expulsion appropriate. “What would you actually have to do to get expelled is what I’d like to know, because it seems like kicking someone’s door down and physically attacking them along with making death threats and stalking them — and doing it twice — should probably be enough,” Elizabeth said. Elizabeth’s case, like the two others mishandled in the U.S. Department of Education’s Office for Civil Rights, or OCR, report from Sept. 1, 2015, highlights an issue in the way MSU handles sexual assault and harassment cases that the university is working to address through revisions and updates to its sexual assault and relationship violence policy. Since before the OCR’s investigation, MSU spokesperson Jason Cody said the university had been working to revise that policy again and continues to do so. And not just the policy, but the process of investigation as well. From adding sexual assault counselors to participating in sexual assault climate surveys, the OCR recommended numerous things to help create a safer campus and improve investigations. A Title IX lawsuit has been brought against MSU, President Lou Anna K. Simon and Maybank by Emily Kollaritsch, Shayna Gross and two anonymous women who allege MSU mishandled their sexual assault and harassment cases by taking too long to investigate, among other complaints. The complainants “respectfully declined” comment because of the ongoing lawsuit. While MSU has implemented some of the OCR’s recommendations and plans to implement more during the course of this year, some students and survivors, like Elizabeth, said the federal recommendations are too vague and do not give clear guidelines for things like repercussions in sexual misconduct cases — something MSU has not clearly defined. A major change to the way MSU handles sexual assault cases was the creation of the new Office of Institutional Equity, or OIE, in April 2015 — before the OCR report was made public — to handle all harassment and discrimination cases, including sexual assault and relationship violence. Along with the creation of this new office, MSU has hired a new Title IX coordinator and six additional Title IX investigators, who work directly with people who report sexual assault or harassment, since the office opened. In Elizabeth’s case, she said her investigator cared about her and supported her throughout the process, but she said she thought she was overworked. At the time, MSU had only two full-time Title IX investigators. While MSU has added resources for victims of sexual assault and harassment, the OCR found MSU had far exceeded federal time constraints for cases under investigation because there was a distinct lack of communication between investigators and the claimant, according to the OCR report. "Every time I had to go meet with an investigator or go to a hearing it was like living (my experience) over again"
Aside from the lack of communication, the judicial process can be long and arduous because it requires several levels of review if either party chooses to challenge findings. Universities are supposed to take no more than 60 days to complete an investigation. In Elizabeth’s case, she underwent nearly a year long process of reviews and appeals. “Every time I had to go meet with an investigator or go to a hearing it was like living (my experience) over again,” she said. In order to make this review process faster, Cody said it has been streamlined by expanding the size of the pool of candidates trained to serve on the student misconduct review panel, which is responsible for imposing sanctions. Along with attempting to streamline the process, MSU created the Sexual Violence Advisory Committee, made up of representatives from various student groups and faculty, which began meeting in fall 2015. Meetings will continue throughout the spring semester, including a planned open meeting with MSU’s campus, MSU’s Title IX coordinator Jessica Norris said. Norris said MSU has already participated in one campus survey — something the OCR recommended — conducted by the Association of American Universities, which found that among female undergraduates who responded, 24.8 percent experienced completed or attempted non-consensual penetration or sexual touching involving physical force or incapacitation. Of the roughly 50,000 graduate and undergraduate students at MSU, 8,352 responded to the survey. MSU has agreed to implement every OCR recommendation and plans to do so by the end of the year, but even with this, students and survivors said they are still concerned with the fact that one person — the vice president for student affairs and services — has the power to overturn the entire process of investigation, while there are no set sanctions for specific violations of MSU’s sexual assault policy. Per the OCR’s recommendation, MSU will list all possible sanctions it might impose following a sexual misconduct finding, ranging from a written warning to dismissal from a course to expulsion. Nowhere in MSU’s policies does it say which sanctions will be imposed for which level of violation. Pooley, who is friends with Elizabeth and has been advocating for better sexual misconduct policies since before the OCR report, said she believes people who are found responsible for misconduct should face set sanctions, so survivors know MSU is serious about handling sexual assault and harassment. Along with subjective sanctions, the entire judicial process is left up to the decision of Maybank if the accused party appeals to her, which is what ultimately occurred in Elizabeth’s case. Elizabeth said this power gives Maybank the ability to overturn and render worthless months of investigation. “Obviously having this one person at the end of months and months of appeals and investigations being able to overturn a decision without any checks and balances is a big problem,” she said. “I felt like someone had punched me in the gut,” Elizabeth said. This decision defined Elizabeth’s case and continues to define her opinions about the way MSU handles sexual assault and harassment. “Her decision further proves to me that the university does not take violating the sexual assault policy seriously and that needs to change,” Elizabeth said.